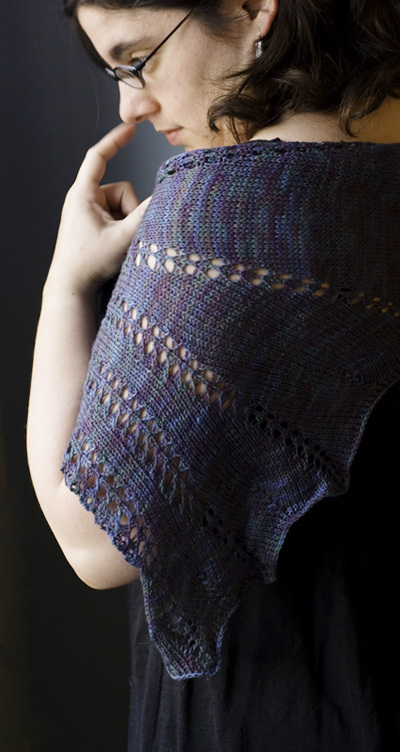 I had the idea to make this shawl when I was looking at the results of an assignment for my other half’s photography class. The assignment was to take a photograph where the only subject you could use was plain white paper. There were many stunning designs created with folds and curves and light and shad, but one stood out in particular. 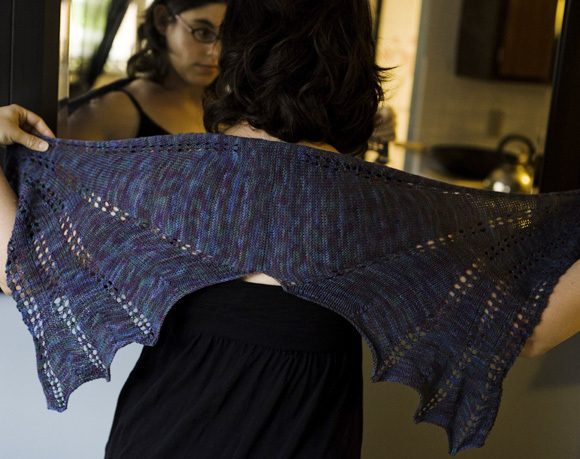 To me this image looked like a pair of wings spread out, and I had the idea to design a shawl that looked like a pair of wings on the wearer’s back. 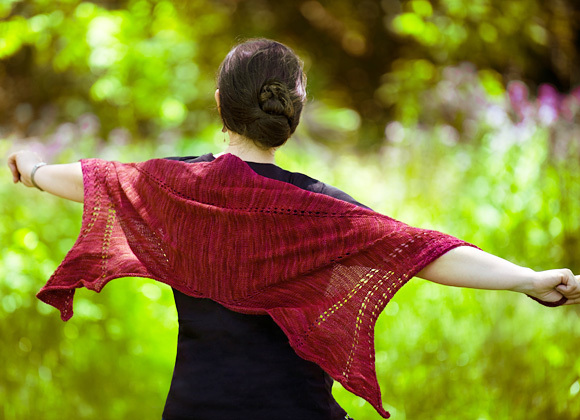 This shawl is knit in two pieces that are joined together at the centre. Some stitches are bound off after working the lace edging to make the winglike edge, and the remainder are put on a holder to create the seam with the second side. The two pieces are mirror images of each other. The larger size was designed to have a similar wingspan, and the centre portion is deeper for greater coverage. The lace edge portion is wider in the larger size as well. 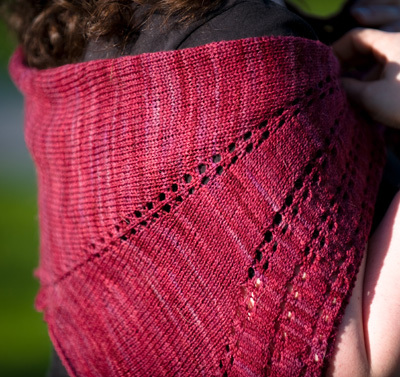 This shawl is knit in two pieces, which are joined at the center back using a three-needle bind off. CO 5 sts. K 2 rows. Row 1 [RS]: K2, yo, place marker, k1, yo, k2. 7 sts. All Even-numbered Rows [WS]: K2, p to last 2 sts, k2. Row 5 [RS]: K to marker, yo, slip marker, k1, yo, k to end. 9 sts. Rows 7-18: Work as for Rows 3-5. 15 sts. Row 21 [RS]: K2, k2tog, yo, place marker, k1, yo, ssk, yo, slip marker, k1, yo, k2tog, yo, place marker, k1, yo, ssk, k2. 17 sts. Row 23 [RS]: K all sts. Row 25 [RS]: K2, *k2tog, yo, slip marker, k1, yo, ssk*; k to next marker, yo, slip marker, k1, yo, k to 2 sts before marker, repeat from * to * once, k2. 19 sts. Rows 27-42: Work as for Rows 23-26. 27 sts. Row 43 [RS]: K all sts. Row 45 [RS]: K2, *k2tog, yo, slip marker, k1, yo, ssk*; k3, k2tog, yo, k1, yo, slip marker, [k1, yo] twice, ssk, k3, repeat from * to * once, k2. 29 sts. Row 47 [RS]: K all sts. Row 49 [RS]: K2, *k2tog, yo, slip marker, k1, yo, ssk*; k3, k2tog, yo, k2, yo, slip marker, k1, yo, k2, yo, ssk, k3, repeat from * to * once, k2. 31 sts. Row 51 [RS]: K all sts. Row 53 [RS]: K2, *k2tog, yo, slip marker, k1, yo, ssk*; k3, k2tog, yo, place marker, k1, yo, ssk, yo, slip marker, k1, yo, k2tog, yo, place marker, k1, yo, ssk, k3, repeat from * to * once, k2. 33 sts. Row 55 [RS]: K all sts. Row 57 [RS]: K2, *k2tog, yo, slip marker, k1, yo, ssk*; k3, repeat from * to * once, k to marker, yo, slip marker, k1, yo, k to 2 sts before marker, repeat from * to * once, k3, repeat from * to * once, k2. 35 sts. Rows 59-70: Work as for Rows 55-58. 41 sts. Row 71 [RS]: K all sts. Row 73 [RS]: K2, *k2tog, yo, slip marker, k1, yo, ssk, k3*; repeat from * to * three times, k2tog, yo, slip marker, k1, yo, ssk, k2. Row 75 [RS]: K all sts. Row 77 [RS]: K to marker, yo, slip marker, k1, yo, *k to 2 sts before marker, k2tog, yo, slip marker, k1, yo, ssk*; repeat from * to * three times, k2. 43 sts. Rows 79-94: Work as for Rows 75-78. 51 sts. Row 95 [RS]: K all sts. Row 97 [RS]: *K to marker, yo, slip marker, k1, yo*; repeat from * to * once, **k to 2 sts before marker, k2tog, yo, slip marker, k1, yo, ssk**; repeat from ** to ** twice, k2. 55 sts. Rows 99-114: Work as for Rows 95-98. 71 sts. Row 115 [RS]: K all sts. Row 117 [RS]: *K to marker, yo, slip marker, k1, yo*; repeat from * to * twice, **k to 2 sts before marker, k2tog, yo, slip marker, k1, yo, ssk**; repeat from ** to ** once, k2. 77 sts. Rows 119-134: Work as for Rows 115-118. 101 sts. Row 135 [RS]: K all sts. Row 137 [RS]: *K to marker, yo, slip marker, k1, yo*; repeat from * to * four times, k to end. 111 sts. Rows 139-154: Work as for Rows 135-138. 151 sts. Row 155 [RS]: K to second marker, slip marker, k1, yo, k14, sk2p, k to next marker, yo, slip marker, k1, yo, k10, sk2p, k to next marker, yo, slip marker, k1, yo, k7, sk2p, k to last marker, yo, slip marker, k1, yo, ssk, k to end. Rows 157-164: Work as for Rows 155-156. Row 165 [RS]: K to second marker, ssk, *sl last st from right needle to left needle, ssk; repeat from * to last st. Break yarn and draw through last st. Place remaining sts on st holder. Work as for smaller version until you have completed Row 70. Row 73 [RS]: *K to marker, yo, slip marker, k1, yo*; repeat from * to * once, **k to 2 sts before marker, k2tog, yo, slip marker, k1, yo, ssk**; repeat from ** to ** twice, k2. 45 sts. Rows 75-114: Work as for Rows 71-74. 85 sts. Row 117 [RS]: *K to marker, yo, slip marker, k1, yo*; repeat from * to * twice, **k to 2 sts before marker, k2tog, yo, slip marker, k1, yo, ssk**; repeat from ** to ** once, k2. 91 sts. Rows 119-134: Work as for Rows 115-118. 115 sts. Row 137 [RS]: *K to marker, yo, slip marker, k1, yo*; repeat from * to * three times, k to 2 sts before marker, k2tog, yo, slip marker, k1, yo, ssk, k2. 123 sts. Rows 139-154: Work as for Rows 135-138. 155 sts. Row 155 [RS]: K all sts. Row 157 [RS]: *K to marker, yo, slip marker, k1, yo*; repeat from * to * four times, k to end. 165 sts. Rows 159-174: Work as for Rows 155-158. 205 sts. Row 175 [RS]: K to second marker, slip marker, k1, yo, k22, sk2p, k to next marker, yo, slip marker, k1, yo, k14, sk2p, k to next marker, yo, slip marker, k1, yo, k10, sk2p, k to last marker, yo, slip marker, k1, yo, ssk, k to end. Row 177 [RS]: K to 2 sts before first marker, k2tog, yo, slip marker, k1, yo, ssk, k to 2 sts before next marker, k2tog, yo, slip marker, k1, yo, k22, sk2p, k to next marker, yo, slip marker, k1, yo, k14, sk2p, k to next marker, yo, slip marker, k1, yo, k10, sk2p, k to last marker, yo, slip marker, k1, yo, ssk, k to end. Rows 179-182: Work as for Rows 175-178. Rows 183-184: Work as for Rows 175-176. Row 185 [RS]: K to second marker, ssk, *sl last st from right needle to left needle, ssk; repeat from * to last st. Break yarn and draw through last st. Place remaining sts on st holder. Work as for right wing until you have completed Row 74. Row 77 [RS]: *K to 2 sts before marker, k2tog, yo, slip marker, k1, yo, ssk*; repeat from * to * three times, k to last marker, yo, slip marker, k1, yo, k to end. 43 sts. Row 97 [RS]: *K to 2 sts before marker, k2tog, yo, slip marker, k1, yo, ssk*; repeat from * to * twice, **k to next marker, yo, slip marker, k1, yo**; repeat from ** to ** once, k to end. 55 sts. Row 117 [RS]: *K to 2 sts before marker, k2tog, yo, slip marker, k1, yo, ssk*; repeat from * to * once, **k to next marker, yo, slip marker, k1, yo**; repeat from ** to ** twice, k to end. 77 sts. Rows 119-134: Work as for Rows 115-118. 101 sts. Row 155 [RS]: K to 2 sts before marker, k2tog, yo, slip marker, k1, yo, k7, sk2p, k to next marker, yo, slip marker, k1, yo, k10, sk2p, k to next marker, yo, slip marker, k1, yo, k14, sk2p, k to next marker, yo, slip marker, k to end. Row 165 [RS]: K1, *sl st from right needle to left needle, ssk; repeat from * to fourth marker, k to end. Join remaining sts to held sts of right wing using three-needle bind off. Row 73 [RS]: *K to 2 sts before marker, k2tog, yo, slip marker, k1, yo, ssk*; repeat from * to * twice, **k to marker, yo, slip marker, k1, yo**; repeat from ** to ** once, k to end. 45 sts. Rows 75-114: Work as for Rows 71-74. 85 sts. Row 117 [RS]: *K to 2 sts before marker, k2tog, yo, slip marker, k1, yo, ssk*; repeat from * to * once, **k to marker, yo, slip marker, k1, yo**; repeat from ** to ** twice, k to end. 91 sts. Row 137 [RS]: K to 2 sts before marker, k2tog, yo, slip marker, k1, yo, ssk, *k to marker, yo, slip marker, k1, yo*; repeat from * to * three times, k to end. 123 sts. Row 175 [RS]: K to 2 sts before marker, k2tog, yo, slip marker, k1, yo, k10, sk2p, k to next marker, yo, slip marker, k1, yo, k14, sk2p, k to next marker, yo, slip marker, k1, yo, k22, sk2p, k to next marker, yo, slip marker, k to end. Row 177 [RS]: K to 2 sts before marker, k2tog, yo, slip marker, k1, yo, k10, sk2p, k to next marker, yo, slip marker, k1, yo, k14, sk2p, k to next marker, yo, slip marker, k1, yo, k22, sk2p, k to next marker, yo, slip marker, k1, yo, ssk, k to 2 sts before last marker, k2tog, yo, slip marker, k1, yo, ssk, k to end. Row 185 [RS]: K1, *sl st from right needle to left needle, ssk; repeat from * to fourth marker, k to end. 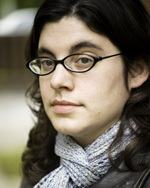 Patti Waters is an independent designer living in Ontario. 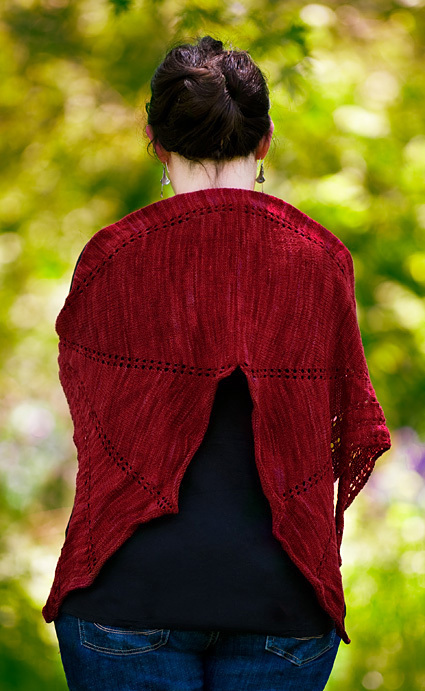 You can find many of her patterns for sale through Ravelry. She manages Passionknit, an LYS in Toronto.